ATLANTA — Doctors told Heather Von St. James that she had only 15 months to live when she was diagnosed with mesothelioma, a form of lung cancer. "I am an optimist by nature, so being a victim just isn't my way of doing things," Von St. James said. 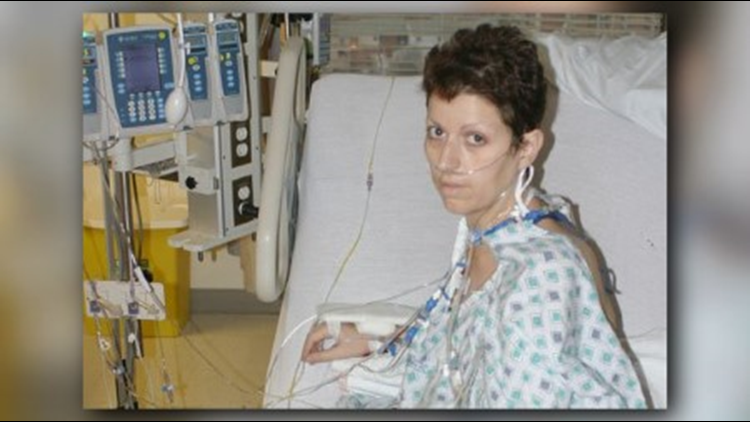 For treatment, she chose a radical surgery known as an extrapleural pneumonectomy. The surgery removed her left lung, half of her diaphragm, the lining of her heart and a couple ribs. Von St. James called it "Lung Leavin' Day" and commemorates it every year. “Lung Leavin’ Day started as a fun way to commemorate a life-changing event, and a way to turn what could be considered a horrible day into something with a positive spin," Von St. James explained. On the anniversary of her surgery every year, she gathers with family and friends, who write their fears on plates and smash them in a fire to symbolize overcoming fear. Lung Cancer Awareness Month is recognized each year in November as a time to raise awareness about the importance of healthy lungs and proper cancer screenings and treatments. More than 200,000 Americans are diagnosed with a form of lung cancer each year, according to the American Cancer Society. There are many types of this cancer, but the three most prominent and deadly types are mesothelioma cancer, small cell lung cancer and non-small cell lung cancer. Mesothelioma is a cancer that affects the lining of the lungs, stomach and heart, and occurs when asbestos fibers become lodged in the soft tissue of these organs. The only known cause is asbestos exposure, even in low, infrequent amounts. Asbestos is a fibrous compound that acted as an insulating and reinforcing agent in most home insulation, tile flooring and ceiling materials in homes and commercial buildings. It has been mostly phased out since 1980, when it became known as the sole cause of this incurable cancer. Asbestos has still not been banned in the United States and millions of homes, schools and commercial structures still contain asbestos. It can still be found in older homes, schools and industrial buildings. There is currently no cure and most patients live only 12-21 months after their diagnosis. Small Cell Lung Cancer makes up 15 percent of all lung cancer diagnoses. These cancerous cells are physically smaller and flatter than healthy lung cells, and their oat-shape is what gives them their name. The leading factors that can cause small cell lung cancer are cigarette smoke, tobacco smoke (from cigars) and exposure to secondhand smoke. Even being in a car with someone who smokes can increase one’s risk of developing small cell lung cancer. A person does not have to be a current smoker to be at an increased risk of developing small cell lung cancer. There are many treatment options for small cell lung cancer, including chemotherapy, radiation therapy, radiation and surgical removal of the tumor(s). This type of cancer is very aggressive, but typically has a prolonged timeline for treatment and recovery. Non-Small Cell Lung Cancer makes up about 80 percent of lung cancer diagnoses (the other 5% are from rare forms of cancer). It is also caused by smoking in about 90 percent of diagnoses. All forms of lung cancer (SCLC, NSCLC and rarer forms) show similar symptoms of fatigue, coughing, weight loss, sore throat and difficulty swallowing, which can all be easily mistaken for common colds, the flu, or bronchitis. This leads to many late-stage diagnoses for patients with any type of lung cancer. NSCLC typically progresses at a slower rate than other types of lung cancer, including SCLC. This typically leads to a better survival rate or an improved prognosis rate than for patients with other types of lung cancer. NSCLC is also more ideal for clinical trials of new treatment methods and drugs. The experimental trial that is currently showing the best results for all forms of lung cancer is immunotherapy.